Anne Ashley rode out Katrina in Hattiesburg Mississippi with her then 85-year -old mother. The physical wreckage was immediately revealed. The cultural fall out - healing and scarring - unfolded in waves over time, driven by the largest population relocation in U.S. history ... abject despair and renewed hope, stronger ties and bonds forever broken. Katrina still ripples through our political and cultural landscape. 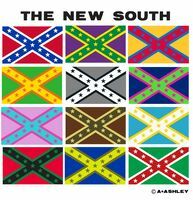 Ms. Ashely reinterprets the divisive symbol of the Old South in colors suggesting nationalities, societies and communities twisting in the socio-political evolution of New Orleans and the gulf coast. It is her acknowledgement of a post Katrina world.